Vietnam is a deceptively big country. From top to bottom, it snakes over 3000 kilometers, and travelers who aren’t careful with their itineraries may find themselves spending more time in transit than actually taking in the sights. On our first visit to Vietnam, we spent two months traveling from Hanoi up to the northern border with China and then down to Saigon in the south. Granted, we did this on the back of a peppy little 100CC Honda Win, but even using buses and planes, there’s so much packed into this country that one month to see it all would have been pushing it. To deal with Vietnam’s length, most travelers either limit their exploration to one segment of the country, or have to settle on a warp speed tour of just a handful of cities that just barely scratch the surface of what Vietnam has to offer. During our recent return to Vietnam, we initially toyed with spreading our three months out across three different cities—Ho Chi Minh City in the south, Hue in the center, and Hanoi in the north—but we quickly realized it would be more rewarding for us as travelers (and for our burgeoning graphic and web design business) for us to stay put in one place and get to know it as best we could; the alternative would simply spread us too thin. Vietnam’s size is both a blessing and a curse—unless you fly (which I think we can all agree is often the fastest but least immersive way to travel), it’s hard to see it all, but being as big as it is, this also means there’s a huge amount of culinary, cultural, and geographical diversity to keep you interested as you travel its length. Part of why I have such a hard time naming a favorite city in Vietnam is because I feel like each region is unique and defies comparison to any other; there’s so much to love about this country and each region has its own particular strengths that I’m always sad when I read about people only visiting a tiny pocket but feeling like they’ve “done” Vietnam. 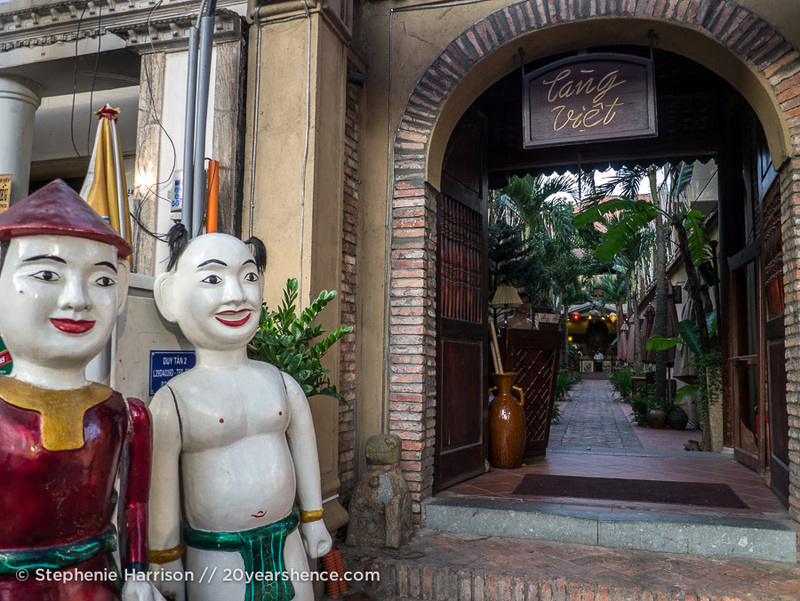 During our final week in Saigon, Tony & I were invited to enjoy an evening at Lang Viet restaurant. In addition to offering a comprehensive buffet featuring regional specialties from throughout the country, the restaurant also houses a water puppet theater where there are twice nightly performances of this northern art. Being together 24/7 and constantly traveling means that our date nights are few and far between, but we figured treating ourselves to dinner & a show would be a memorable way to bid farewell to the city (and Vietnam). I have been very vocal about how one of the things I love about Ho Chi Minh City is the frenetic, frantic energy of the place. Generally I like how electrifying and dizzying it is here, but obviously the flip-side of everything being so helter-skelter all the time is that it can sometimes be a tad overwhelming and a bit exhausting. It’s nice every so often to escape the bustle and just chill out. What’s remarkable is that you don’t generally have to go very far—often just down a cloistered hem or perhaps into a temple courtyard or a chic little café—and the buzz of the city pretty much melts away. I can now safely add Lang Viet to my list of oases as well. 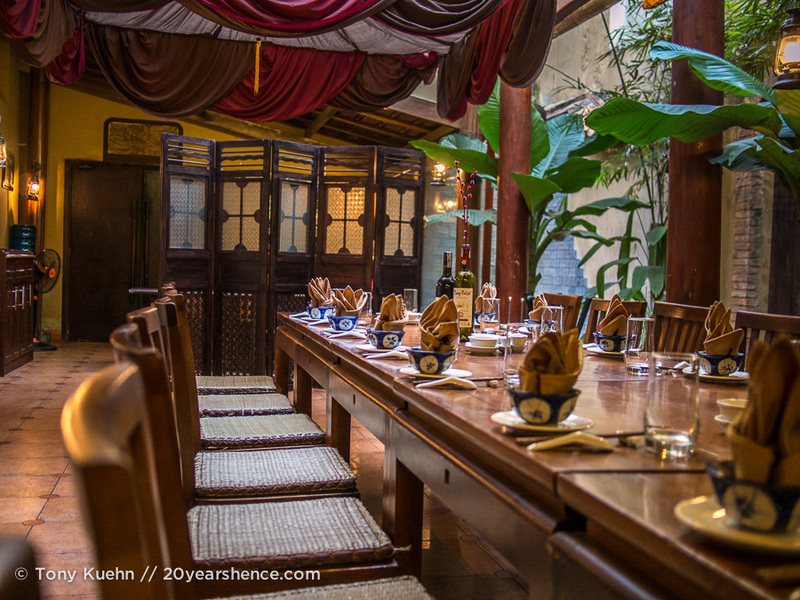 Set in a gorgeous old colonial building, the atmosphere of Lang Viet is heady with lush elegance; stepping through the gates is like being transported into an opulent past. It oozes old-world chic, feels delightfully posh, and has an intoxicating languor about it. 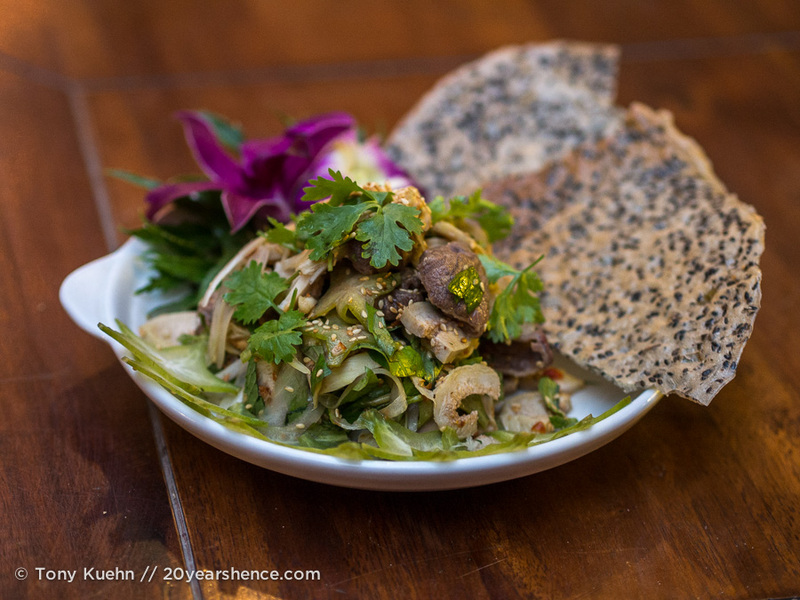 When I later spoke to Lang Viet’s owner, Le Ba Khang, he remarked that although the restaurant receives plenty of local patronage, for the most part, Vietnamese clientele prefer a rowdier atmosphere than the refined tranquility that pervades here. Having sat in plenty of local establishments where most conversations sound like arguments as voices rise to be heard over the omnipresent din, I see his point. However, as a westerner, I love how the honk of motorbikes are drowned out by the soft trickle of fountains, and the scent of orchids perfume the breeze; Lang Viet lies recessed down a walkway (styled to feel a bit like a cobbled country lane) just a few meters from a busy main road where all is chaos, in here it is a sea of calm. I wouldn’t want this to be my Vietnam experience all the time, but as an occasional reprieve from the urban clamor, it is certainly welcome. Notoriously indecisive, I’m one of those annoying diners who always wants to try everything on the menu and can never make up my mind. 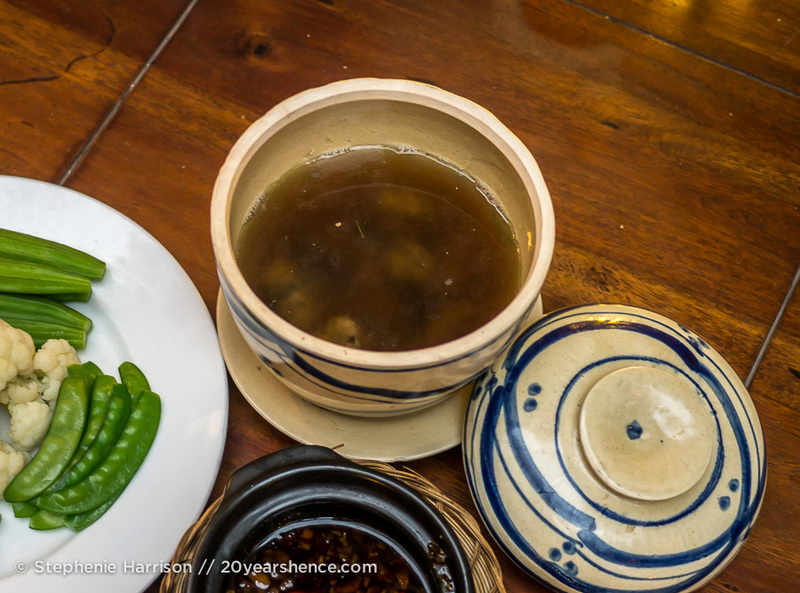 This is especially problematic in Vietnam where everything is SO GOOD, and also why I generally tend to gravitate towards restaurants that just serve one dish, which means my choice is already made. 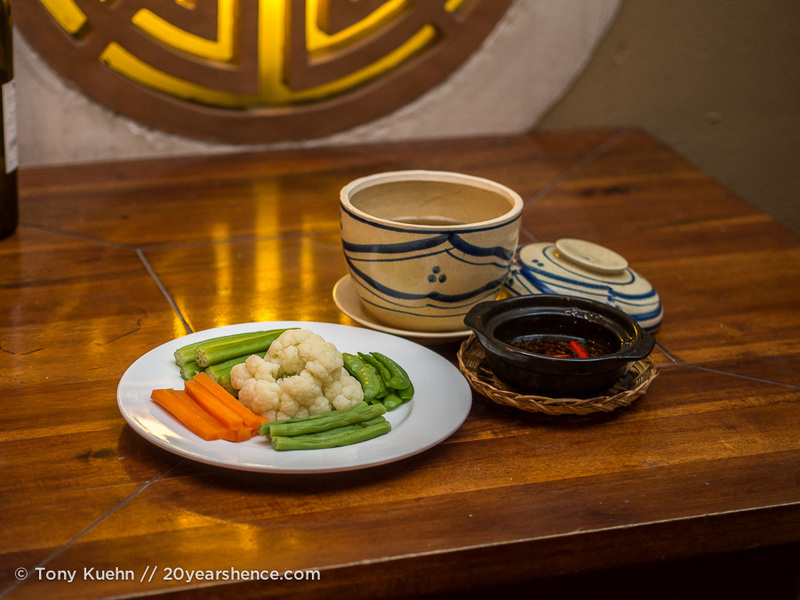 But at Lang Viet, an even better option is available, as they offer a sit down buffet which means you get to sample all the things! One of the things that surprised both Tony & me when we first visited Vietnam is that certain dishes are really prominent in certain parts of the country whereas other dishes are much harder to find—many of the dishes that we knew and loved from Vietnamese restaurants back in Toronto and Nashville were southern specialties (it took us a few days of wandering around Hanoi in the north wondering why we couldn’t find any of our favorite dishes to figure this out) and that there was a whole slew of northern dishes for us to explore. 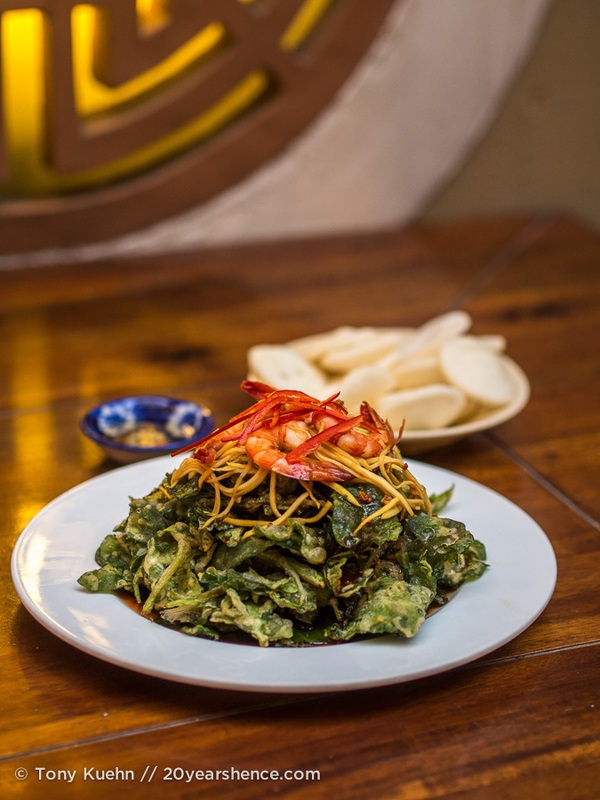 In a large metropolis like Saigon, it’s generally possible to find dishes from all over Vietnam, but in many cases you will have to go to specialty restaurants to find them. At Lang Viet, the buffet has been carefully assembled so as to take diners on a culinary tour, showcasing dishes specific to all three regions of the country. Additionally, Khang and his head chef have worked together to create a few signature dishes, and pride themselves on presenting all of the food in a modern, elegant way. *We also ate banh khoai—crispy pancakes stuffed with shrimp and pork—but we accidentally devoured these before taking a photo. Oops! All of the dishes that we sampled were truly excellent and beautifully presented. I noticed that there was a slight bias towards dishes originating from the northern portion of the country and Khang confirmed this—his father’s side of the family hails from the north and, in his opinion, this section has the “purest” Vietnamese food. 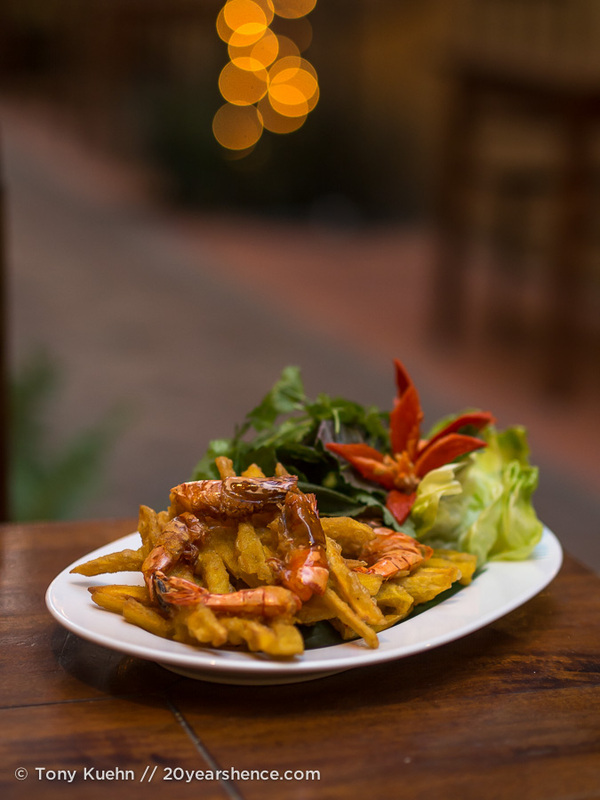 Unlike the south, which shows heavy influences from the French and has been more permeable with the west, Khang believes that northern food provides the truest examples of the country’s cuisine. 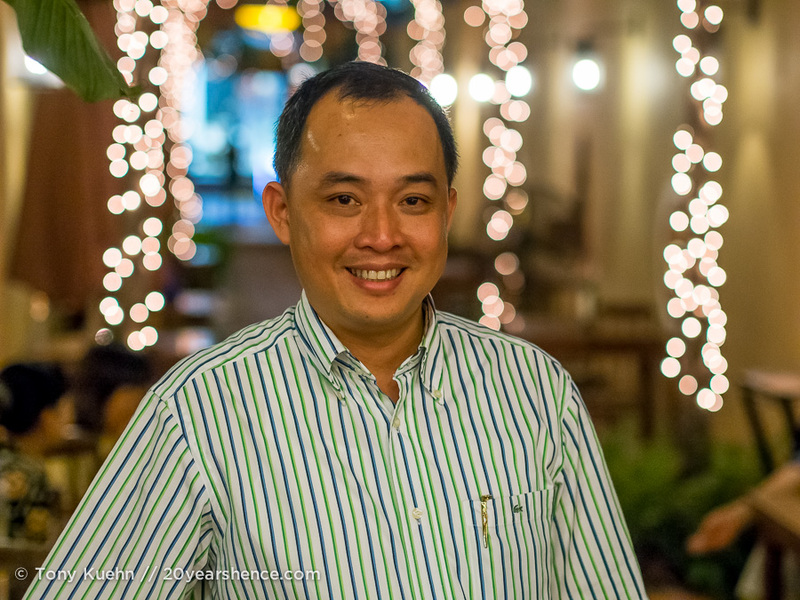 However, he and his team really worked to put together a menu that celebrates the diversity of dishes found throughout the entire country, and have gone out of their way to highlight regional produce and dishes, such as with the beef & fig salad (the figs came from Dalat) and the banh khoai (mini pancakes), a signature dish from Hue. 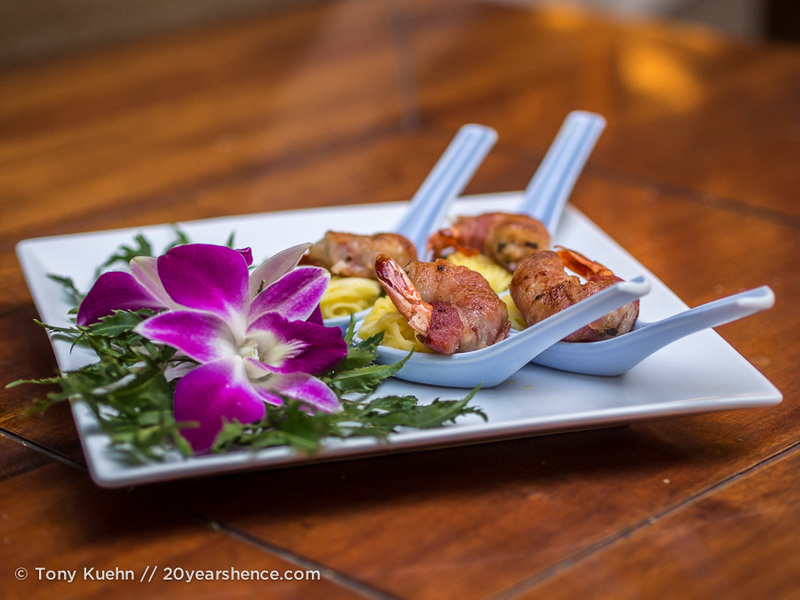 Lang Viet is also always working to develop modern flavor profiles that use traditional Vietnamese ingredients in unexpected ways—the bacon wrapped shrimp dish was certainly one you’d never find in a local quan, but the marriage of flavors between all of the components worked wonderfully. 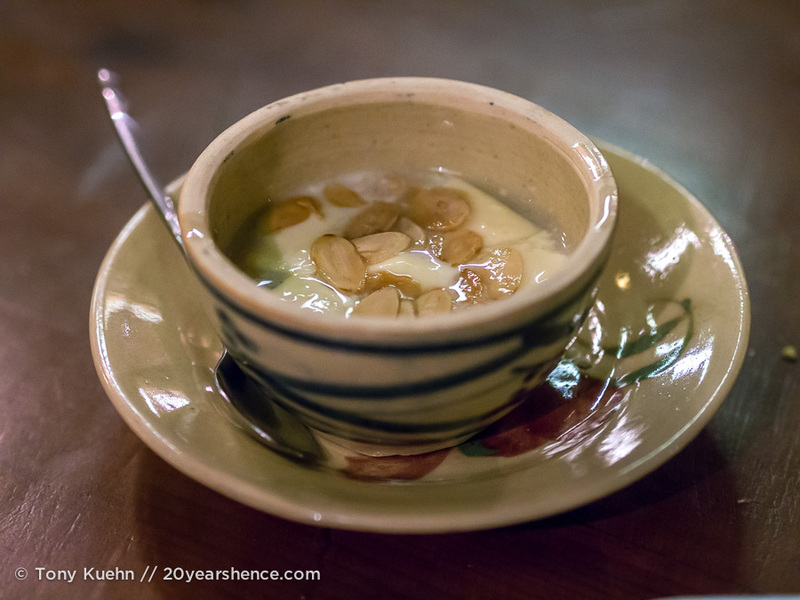 The same is true of the incredibly innovative yogurt dessert—it had all the flavors and correct components of a traditional Vietnamese dessert, and yet it was completely original and totally in keeping with the elegant atmosphere of Lang Viet. What I love about Vietnamese food is how every dish features bright flavors, a combinations of textures, and nothing is overly heavy or greasy but is always light on your palate. Lang Viet’s buffet was exactly this times 10 as all of the dishes were stupendous in their own right, but together, they resulted in a truly unforgettable feast that really did highlight the very best of Vietnamese cuisine. Having had the good fortune to have sampled most of these dishes in their places of origin and in other restaurants, I am confident in saying that Lang Viet’s renditions were truly top notch and some of the best we have tried anywhere in the country. I’ve said it before and I’ll say it again: I always appreciate an artistic flourish and eye for detail, but when it comes to food, taste wins out every time. Thankfully, Lan Viet really delivers on the food front and I would have happily had seconds of every single dish we tried. Following dinner, it was time for the water puppet show. For those, unfamiliar with water puppets, I feel you. Tony & I first witnessed this traditional production when in Hanoi and were similarly in the dark regarding what we were in for. What followed was one of the oddest, trippiest experiences of our lives, the kind of thing where we wondered if it would have helped or hindered had we partaken in some kind of hallucinogenic beforehand. Originating from the Red River Delta region of the north, these water puppet productions first began as games played (with puppets… in the water… as you might have inferred from the name) along the river and eventually evolved into elaborate productions that were performed during festivals. Most of the skits revolve around slices of traditional country life, and also feature many of the fables and origin myths with a fantastical bent that have been passed down through the generations about how the Vietnamese people and their country came to be. As you might expect, these creation skits are insane, and even with English explanations, they make little to no sense. At Lang Viet, no subtitles are provided during the performance and apart from a pamphlet that gives a cursory description of each skit that one could probably surmise independently (e.g., “Dragon Dance”, “Children Playing in Water”), viewers are left in the dark as to what they are seeing. Initially, I felt this was a negative aspect to the production, but then, when I thought back to our prior experience, I had to concede that honestly, the translated narration that was provided during each sketch did very little to illuminate what we were seeing (and why we were seeing it) and wasn’t very helpful (in part due to “Engrish” issues, but also because the material itself is so bonkers). While I am certainly mindful that there is a rich historical and cultural component to water puppetry, I personally find it most rewarding to simply switch off the “logic” side of my brain and allow my senses to be dazzled by all of the bright colors and crazy special effects. I do think that for someone who wanted a deeper understanding of what they were seeing, the show at Lang Viet might be a bit disappointing and I think it might benefit from a little more context (perhaps a brief introduction at the start of every skit stating the name and why it’s an important part of Vietnamese culture). Compared to the production we saw in Hanoi, Tony & I both felt that the quality of the effects and the musical accompaniment at Lang Viet was far better and more impressive (and it was actually nice to not have the distracting narration occurring during the actual skits). 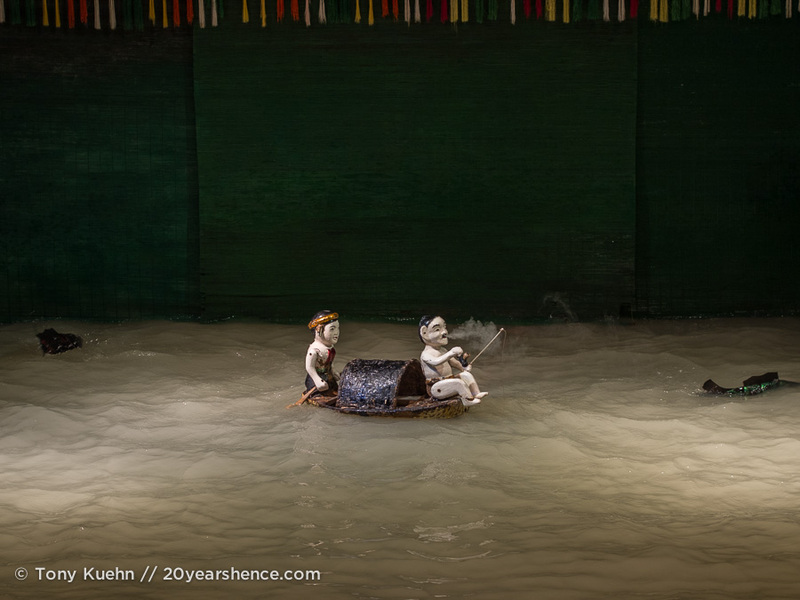 Even if you leave feeling less than enlightened and slightly befuddled by the whole thing, I do think that water puppet theater is one of those things you’ve just got to experience at least once if you’re visiting Vietnam. It’s kitschy and just a little bit batshit crazy… kind of like Vietnam as a whole really! 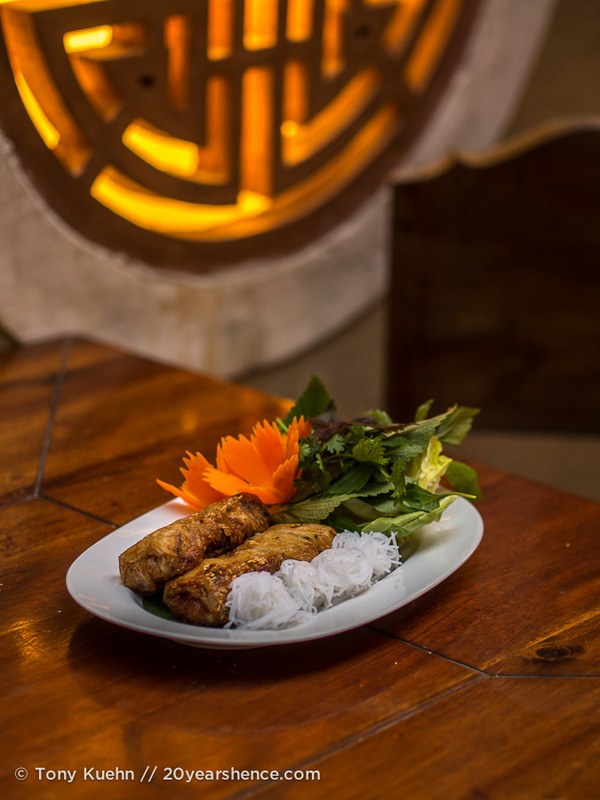 At 400,000 VND (~$20USD) per person for dinner and another 150,000VND (~$7.50US) for the water puppets, an evening at Lang Viet definitely qualifies as a splurge in Vietnam. However, during this trip, we’ve definitely learned that the old adage of getting what you pay for is often right on the money (forgive the pun!) and this proves no exception. Having dined at some of Ho Chi Minh City’s best Vietnamese fine dining establishments, I would say the quality of the food (and the incredible ambience) justifies the hefty price tag on the food—you can certainly eat for cheaper on the street, but in terms of being able to sample such a wide array of dishes and have them all be so uniformly good in a single spot, I’d be hard pressed to offer up a better alternative in Saigon. Add in the water puppet performance, and you have yourself a truly spectacular and unique night out that is perfect for a special occasion or those looking for an over-the-top Vietnamese extravaganza. And really, when in Vietnam, over-the-top extravaganzas are really the way to go! 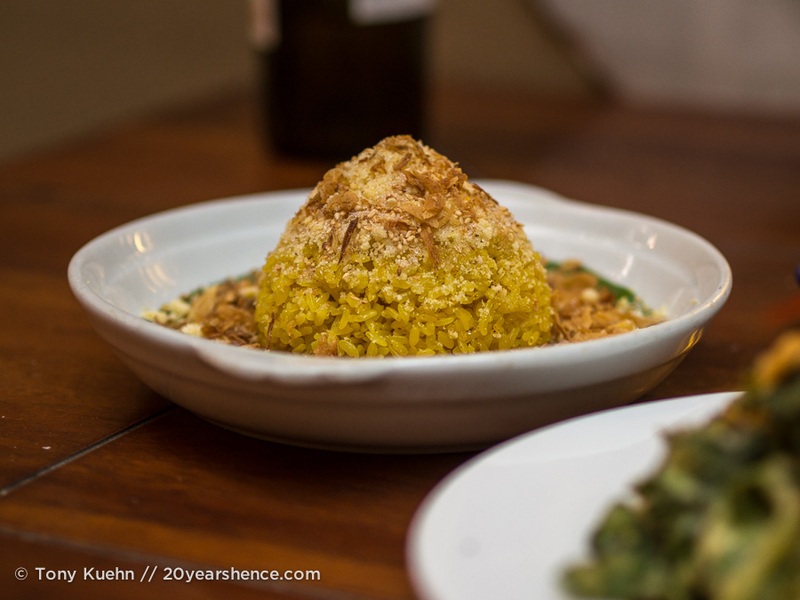 Tell us: Would you like to eat your way through Vietnam? 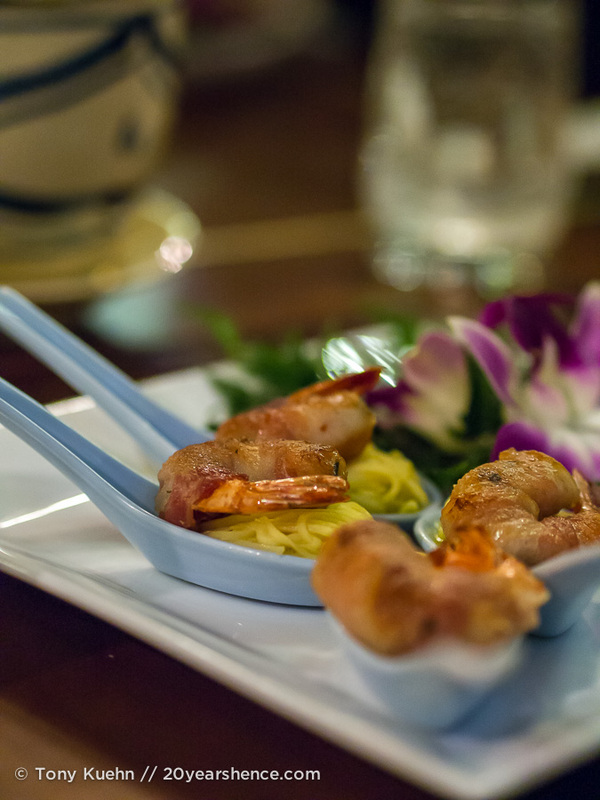 Does your ideal date night consist of dinner and a water puppet show? Thank you to Lang Viet for hosting us and providing us with a complimentary meal and water puppet performance. It was a truly memorable way to wrap up our 3-month stint in Saigon and bid farewell to a city—and country—that we love from the bottom of our hearts. Although the evening was provided to us free of charge, it was not done so contingent upon a positive review and all opinions expressed here are my own. That is such a beautifully decorated restaurant! And not only do you get dinner, but a water puppet show! 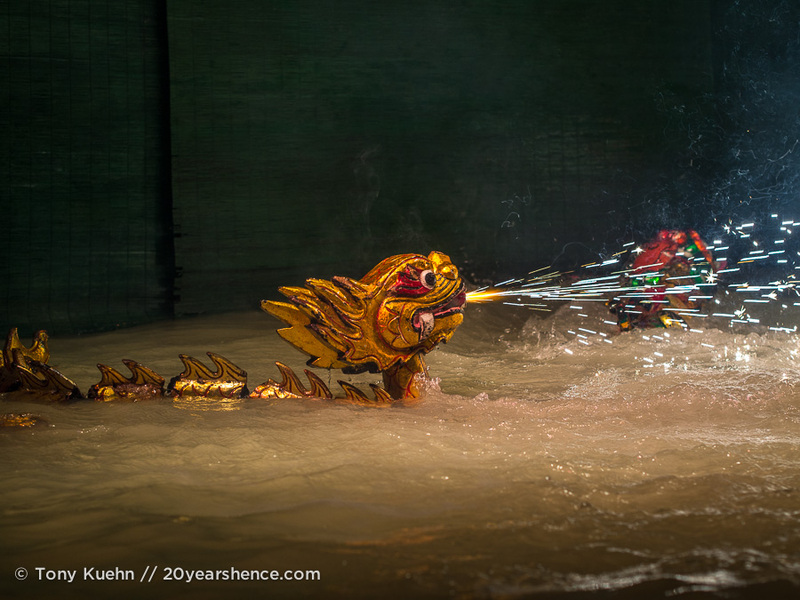 I’ve never seen a water puppet show but it looks pretty darn cool. I kinda like how the stories seem pretty out there as well! 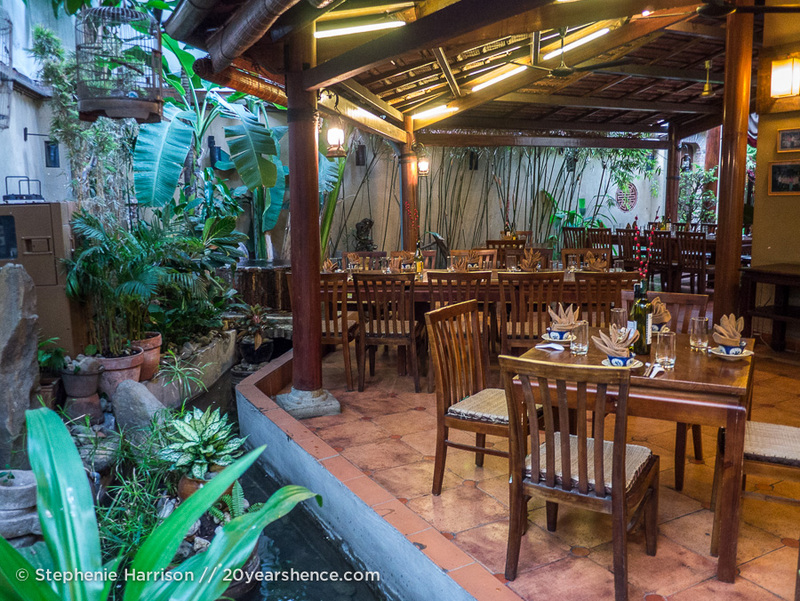 Saigon is full of beautiful restaurants, and this one is definitely in the upper echelon! Water puppet shows are utter insanity. I highly recommend you attend a performance if you ever get the chance! 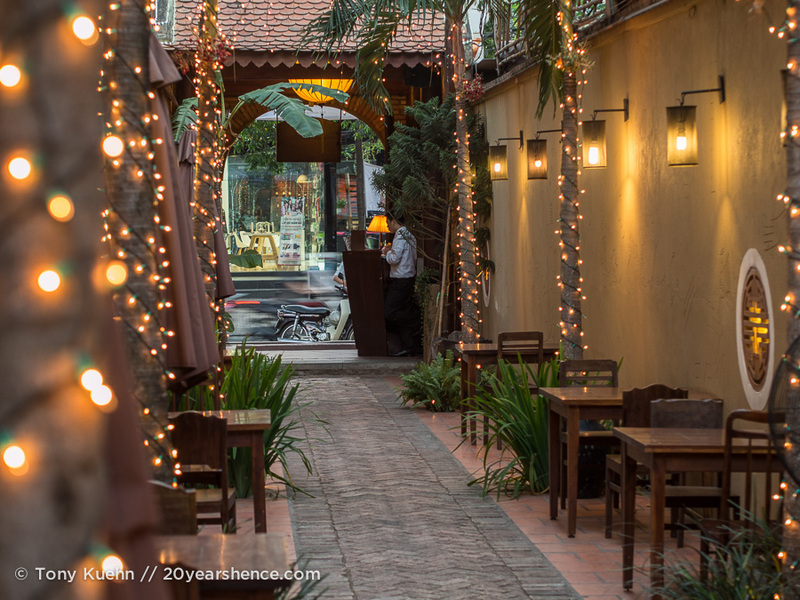 I wish I’d known about this place when we were in HCMC! We only had 10 days to spend in the country and it would have been wonderful to experience some of the regions we missed through the food. Next time hopefully we’ll get to spend more time there, but if not, at least I’ll know where to go for dinner! I’m not sure exactly when you were in Vietnam but this restaurant is fairly new (I think only a year old) and not very well publicized/advertized (if not for James, we wouldn’t have known about it, even though it’s only about a 10 minute walk from where we were living!) so chances are you couldn’t have gone anyway. But next time, you must! Dinner and a show! Sorry, but there is just nothing better than that, is there? As always Steph, I was captivated by your writing and Tony’s photography…gorgeous! Corinne recently posted..Gardens by the Bay, Singapore’s Highlight Attraction! Thanks so much, Corinne! You’re right that it doesn’t get much better than dinner & a show when it comes to treating yourself to a nice night out, and this was no exception! Yes, we knew we were in trouble when we scheduled one month on our first visit and hadn’t made it south of Hanoi after 3 weeks! I’m glad we had the freedom to add in an extra month and really try our best to do it justice. And I’m so glad you understand the utter craziness that is water puppet theater. We went in blindly in Hanoi and spent the 40 minutes wondering what exactly we were seeing… I’m not sure anything can ever top your first exposure to it! Lovely photos! Makes me hungry again. Fig salad FTW! James recently posted..Zombies, Cheese and Bacon Pillows – Can You Ever Go Home Again? I sense big changes since 1970, maybe the two Vietnams are finally unified? That would be good. Yes, I think Vietnam today is very different from the ’70s and the country is definitely more unified. That’s not to say there aren’t still some squabbles and in-fighting, but the same is true of most countries… even the good ol’ USA! Oh my, those sweet potato shrimp fritters look delicious. Your food posts always make my mouth water. So much food! When I travel to countries that are big and daunting in terms of how much they have to offer, I’m totally torn between those two types of travel: blitz through as much as possible, just skimming the surface, or focus on one area and really get to know it? 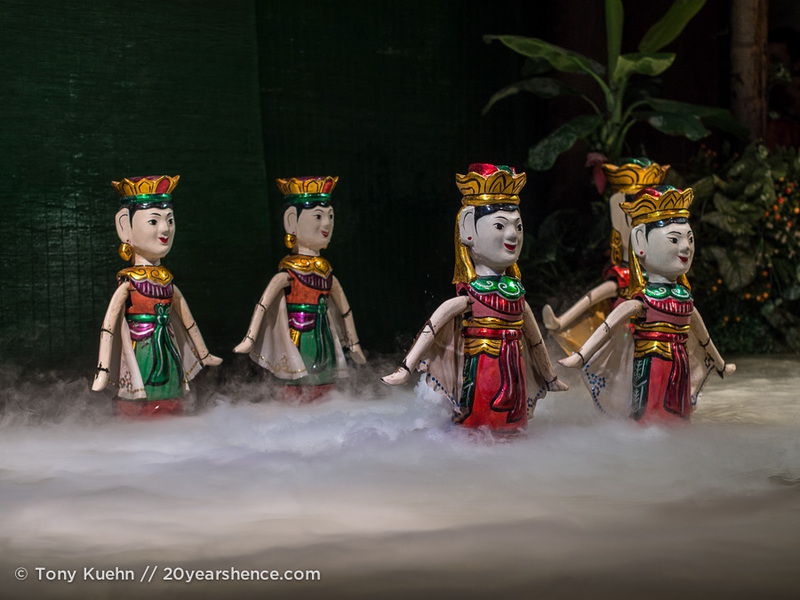 Water puppets sound like a very cool experience – what a great way to end your time in Vietnam! I admire how you shows to us the beauty of the restaurant. It reflects to the beautiful photos. Thank you, Ben! I’m glad the photos managed to capture a smidgen of Lang Viet’s loveliness! Wow. I’m really sorry we missed the water puppet show now. Since a young age, I was very adamantly anti-buffet. My parents found this to be a strange phenomenon in their 9-year-old, but it’s a policy that’s worked out well for me. But that does NOT look like a buffet. What gorgeous presentation. I’m only sorry we missed that too. Vietnam certainly is a country that deserves ample time for exploring. Even though we did fly up to central (thank you very much Tet…grr…), you do miss a lot that way. I long for the day we can go back and take our time on motorbikes exploring the full country. Yes, this was definitely more of a “seated buffet” (the food came to us, not the other way around! ), more like a tasting menu, really. Even those who tend to boycott those kind of things, I think this would be a worthy exception. Those dishes look amazing! I’d love to go to Vietnam some day and sample the tastes, travelling north to south or vice versa! PS – You have quite an eye for food photography too! Thanks, for the kind words, Tim. 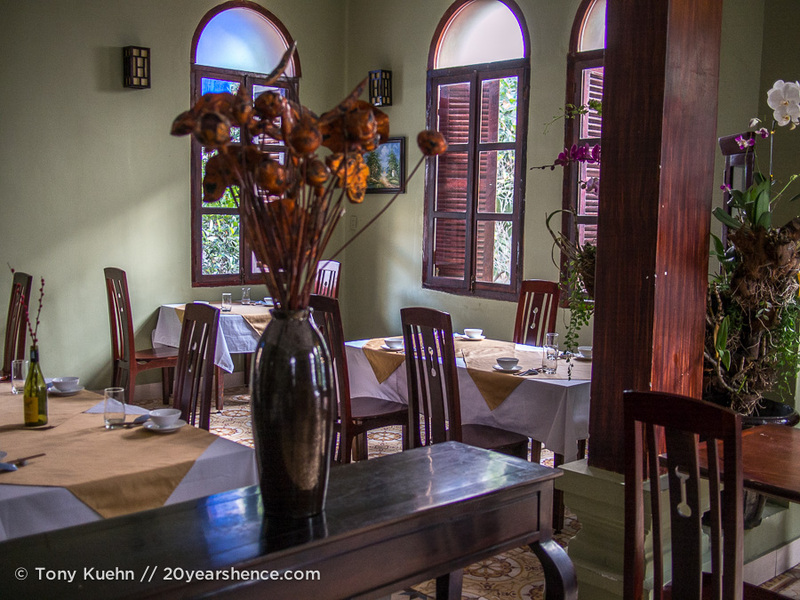 I hope you make it to VN one day and get to eat your way through this marvelous country… you won’t be disappointed! Well, lovely dining!!! 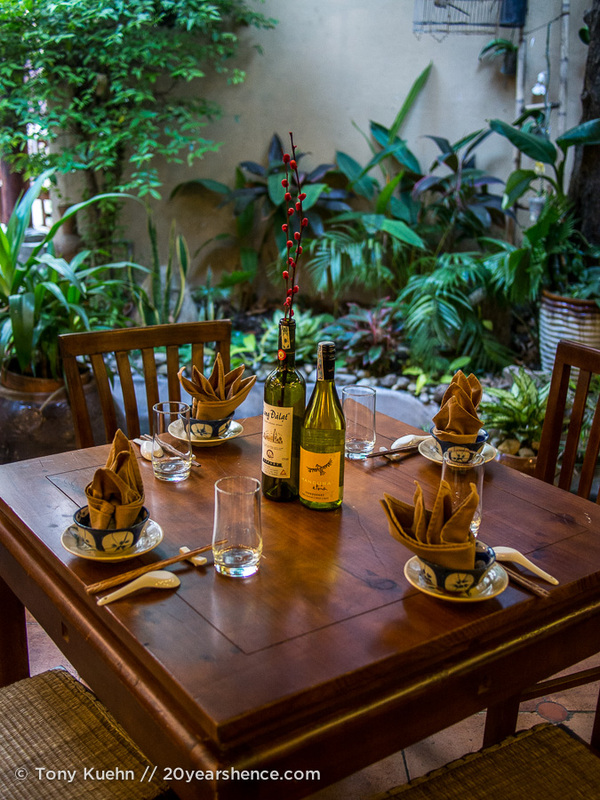 It seems that you enjoy some traditionally typical Vietnamese dishes and Water Puppet Show. Dinner and show are the great combination.